THIS IS not an unfamiliar topic. 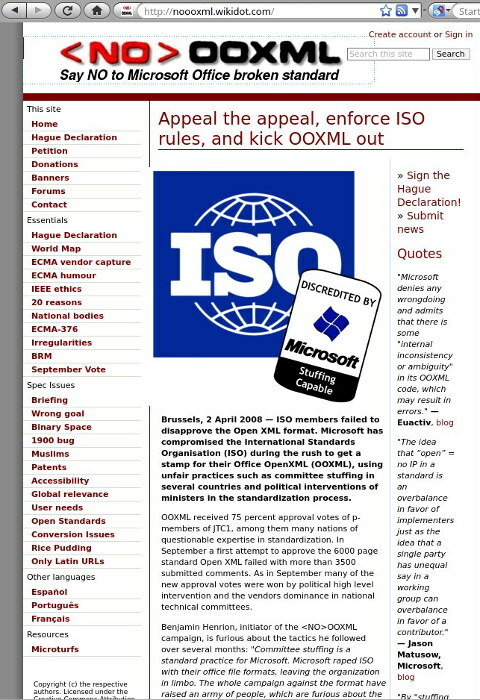 A decade ago (or more) we wrote hundreds of articles about Microsoft’s OOXML-related abuses. Corrupt European Patent Office (EPO) officials now help the abusers from Microsoft by advancing their fake ‘standard’ that they bribed and corrupted ISO for. The U.S. Patent and Trademark Office (USPTO) does too, but the latter is based in the US (where Microsoft is based, unlike ISO, which is Europe-centric). It’s like Patent Factory Europe (PFE). WIPR has since then done a puff piece for this troll’s PR campaign and it’s comical that those taxing everything with patents, harming small businesses the most, are trying to hide that fact by associating themselves with “Startups and Small Businesses” and “SMEs”. It is, at best, a googlebombing strategy. They wish to drown out the truth with press releases and lies. The subject of FRAND has meanwhile resurfaced. The same people who push this PFE nonsense are best known for lobbying on FRAND in Europe. They front for large corporations, notably Microsoft. “I am reminded that FRAND worked its way into the ITU’s false definition,” a reader told us, linking to ITU’s definition of “Open Standards” after Microsoft lobbying/entryism (we covered this before). This is a follow-up to last month’s post on an open letter that 77 former government officials and professors (of law, economics, and business) sent Assistant Attorney General Makan Delrahim in order to remind him of long-standing and consistent U.S. policies on standard-essential patents (SEP) under both Republican and Democratic administrations. I’ve meanwhile become aware of the AAG’s reply, which does not provide any indication that he’s on the side of innovation and fair competition. To his response, Mr. Delrahim attached a letter dated February 13, 2018 from about a dozen academics and former government officials that support the statements he makes, which he describes as “the United States’ policies” (we’ll talk about that further below). With the greatest respect for those individuals, they do not collectively counterbalance the 77 signatories of the letter that criticized Mr. Delrahim’s statements. That’s not just a matter of numbers: for an example, there is no former FTC chairman among them. Also, before the academics’ February letter, there was a very impressive industry letter to AAG Delrahim in January, signed by industry bodies such as CCIA, the Fair Standards Alliance, the Software & Information Industry Association (SIAA), and ACT | The App Association, but also by major tech companies such as Apple, Intel, Microsoft, Samsung, HP, Dell, and Cisco. It’s very hard to understand why neither of those letters appears to have given AAG Delrahim pause. Does he seriously think he can make his contribution to #MAGA by acting against the likes of Apple, Intel, HP, and Microsoft–and trade organizations that have such companies as Google among their membership? THE gross saturation of patents in the United States used to work in favour of patent law firms, at the expense of firms which actually produce things. “Since when have patents become merely a tool of ‘wholesale’ wealth passage?”So that’s even over 0.1 billion dollars (all in all). Based on potential alone, or the mere claim of potential. Since when have patents become merely a tool of ‘wholesale’ wealth passage? Patents were not originally envisioned as such and this does not contribute to innovation, it just makes already-rich people even richer. Now let’s look at so-called F/RAND, which ought not exist in the first place. It’s the basic idea that even industry standards are ‘owned’ in the patents sense, and we’re supposed to think that’s “fair”, “reasonable” and “non-discriminatory”. In reality, it is the opposite of all these things. It’s an unjust tax which empowers monopolies. It is certainly good news that litigation is decreasing, but software patents ought not be viewed as patent-eligible anymore. A lot of these transactions Chien speaks of are akin to FRAND and it’s a form of loophole, just like the so-called ‘NPEs’ (trolls) she alludes to. Sprint, the US’s fourth largest mobile company, has launched a patent infringement lawsuit against Charter alleging that the cable TV giant infringes on 11 patents relating to voice over packet (VoP) technology. The case was filed in Delaware district court earlier this month and marks the latest attempt by Sprint, which is owned by Japanese tech giant Softbank, to monetise its patent portfolio. As well as the suit against Charter, Sprint also filed a case using the same patents against another cable business, Mediacom Communications. Unfortunately, VoP is — quite arguably — about software, just like VoIP (Internet Protocol, which deals with packets too). We hope that Charter will fight back and attempt to invalidate these patents (invalidating a dozen won’t be cheap and definitely not fast). “A lot of that tax pertains mostly if not entirely to software patents.”The term “royalty” is a euphemism for tax. This new article by William New speaks of the 5G tax, which we wrote about earlier this winter. 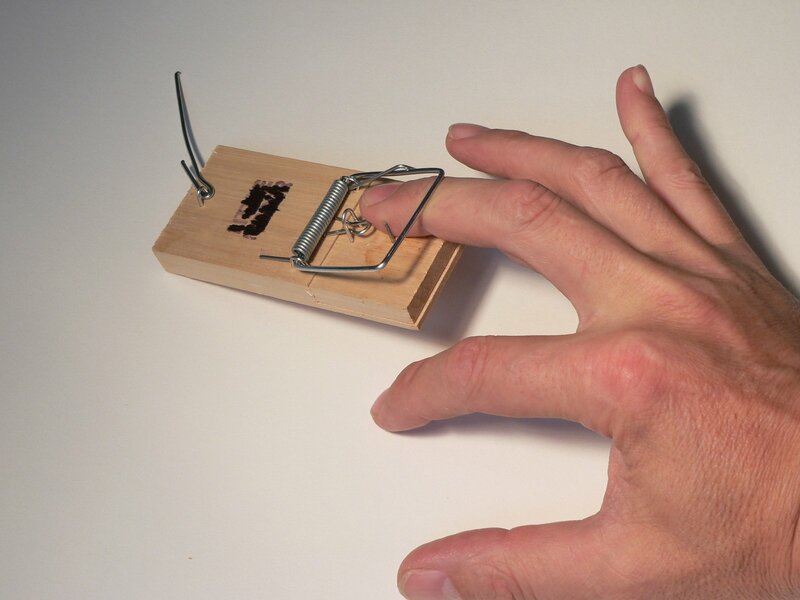 YESTERDAY we wrote about the EPO‘s friends, who represent or front for patent trolls, influencing the European Commission (EC) into the patent thickets trap. They now add insult to injury. For those who don’t understand the ramifications, see this new article titled “Qualcomm 5G Royalty Rate Shines Light on Dispute With Apple”, among others [1, 2] (we mentioned more articles about it last night). “No signs of dignity there.”Apart from the fact that it’s a slur which dodges a real debate about how standards come into being, it also stigmatises the ‘opposition’. No signs of dignity there. “The SEPs guidance was particularly well received,” Managing IP wrote today. “Well received”? By who?! THE policy regarding patents in China has made Asia increasingly friendly to patent trolls. Korean and Japanese companies, for example, are being dragged into Chinese courts (much of their production was outsourced to factories in mainland China). What we are seeing here is actualisation of our predictions. Does China want to be known for patent trolls or for manufacturing (or both)? 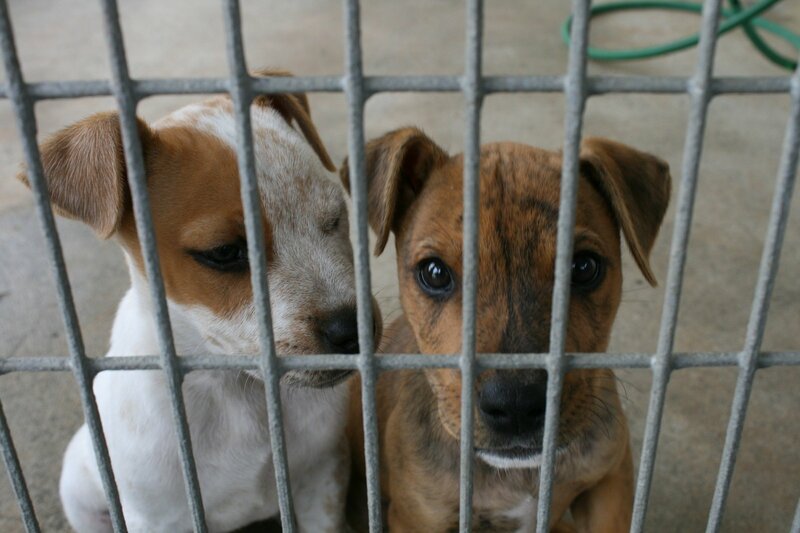 The ADR scheme was also described by the government as a “licensing award system for SEPs”. In short, it proposed that when two parties could not agree on an SEP licence agreement, the prospective licensee would be able to request mediation by the JPO, which would determine a FRAND royalty rate in a mandatory process, “with due care of not unfairly haring the interests of the patent holders”. Major global rights owners raised numerous objections, branding it as a form of compulsory licensing. This has become a hot topic because companies like Qualcomm, which IAM again glorified a few days ago, want to create industry standards everyone must pay Qualcomm to merely implement. There are many software patents in the mix, even though such patents are no longer potent anywhere but China. The European Commission’s long-awaited Communication on the licensing of standards essential patents was finally published this morning and, on an initial read, it looks like SEP owners have a fair amount to be pleased about – especially given how things were looking a couple of weeks back, when it seemed as if extensive lobbying from the implementer side was about to bear fruit. A subsequent delay in agreeing the final text of the Communication provided a hint that implementers might not get all they were after and today’s publication seemingly confirms that. My guess is that SEP owners are going to be feeling a great deal of relief today. The Commission has acknowledged that while the rapid and efficient diffusion of technology at the lowest cost possible is vital, those who do the innovating need to be incentivised to carry on – and that means they have to feel they will receive adequate reward for the investments they make. Is this any worse than the Commission turning a blind eye to EPO abuses? Writing behind a paywall IP Watch has covered this as well (under the headline “European Commission Announces Guidance On Copyright Enforcement, SEP Licensing”). TECHRIGHTS published many thousands of articles about Microsoft, particularly regarding the company’s use (or misuse) of patents. It’s no secret that Microsoft front groups and other nefarious lobbies want to make Free/Open Source software more difficult (if not impossible) in Europe. Microsoft lobbies if not bribes for the removal of GNU/Linux not just from Munich but also anywhere else around Germany and Europe as a whole. We wrote many articles about it over the years. We gave many concrete examples. We also published some secret E-mails to that effect. The evidence is there, but corporate media is rarely interested in such stories; there’s a PR campaign going on now. It’s more profitable. Nasty spin is what brings income. Malicious companies that elevated themselves to dominance/monopoly by dirty tricks and sometimes crime don’t just change overnight; they might simply hire more lobbyists (for better connections) and deploy better marketing. “Microsoft loves Linux” is one of the latest incredible lies*. “Malicious companies that elevated themselves to dominance/monopoly by dirty tricks and sometimes crime don’t just change overnight; they might simply hire more lobbyists (for better connections) and deploy better marketing.”Recently we saw further evidence that Apache had been compromised. Microsoft paid the ASF too much and even put its own ‘moles’ (or full-time staff) in leadership positions at the ASF. And let’s not even mention the LF and OSI. That may be a subject for another day. Notice how Microsoft never joined OIN and never promised not to sue/threaten with patents (the same promise needs to be made for Microsoft-connected patent trolls). In 2017, unfortunately, Microsoft continues to operate like the Mafia; it pays those who may otherwise speak out (or simply ‘eliminates’ them) while patent blackmail goes on covertly. K&L Gates has launched a European Patent Office (EPO) practice. The new practice, combined with K&L Gates’ network of intellectual procurement, portfolio management, and litigation lawyers and patent attorneys makes it the only fully integrated global law firm with full-service patent capabilities in the US, Australia, and Europe, it claims. “Some time back, we embarked on the mission of bolstering our global patent prosecution capabilities to include an EPO practice in order to better provide our clients with a truly global IP solution,” said Robert M. Barrett, a partner at the firm’s Chicago office. Remember that a lot of the staff is connected to the BSA, which we’ll come to in a moment. As we have been pointing out for a number of months, the “IoT” buzzword is nowadays being used as a loophole for software patents. Another such word is “AI”, which only yesterday Watchtroll tried to frame as patentable (in spite of Alice). A few days ago we saw a new press release that said “AI Technology Patents” in the headline. “AI” is just a codeword for software patents which are neither allowed nor enforceable in the US anymore. “Procurement Software Company Xeeva Announces Receipt of Multiple AI Technology Patents,” it said, but these are simply software patents ‘dressed up’ as something scientific or smart. As we shall show in a moment, Microsoft uses such buzzwords more and more. “What we basically have here are patent radicals plotting to put software patents right inside standards using the “IoT” buzzword.”As for the EPO, internal documents exposed that it had offered Microsoft an inherently-discriminatory fast lane. And yet, the "SMEs" lies continue to be trotted out. Here’s one from Friday, followed by retweeting of others who do the same. This is all based on a big lie from the EPO — the pure nonsense which is EPO working for SMEs rather than to their impediment/detriment. See “Using intellectual property to help large multinationals harness their innovative edge” — that’s the headline and tone of an article published by IAM some days ago. We’re expected to believe that anyone other than these “large multinationals” (or patent trolls) would benefit. But nothing could be further from the truth. Now comes the interesting part. Last month we wrote quite a bit about IP Europe and the EPO. Days ago someone told us about “European Standardization” with “Francisco MINGORANCE (IP Europe)” in it. It’s about so-called ‘IoT’ and there’s a “Kick-off meeting CEN-CENELEC/WS IoT SEP licensing” (“SEP licensing” is standard-essential patent tax). So the lobbyists are once again killing everything that is sane! Mingorance isn’t new to us. We wrote about him when he worked for the BSA and more recently in relation to the UPC and EPO [1, 2]. They’re all pretty close. Incidentally, only days ago IAM published this article titled “Monetising patented wireless technologies”, composed by Marc Pépin from TechPats, Ottawa, Canada. About a week ago we also heard from inside sources about a war on Free software in wireless technology. They’re understandably concerned when software patent are being painted “IoT” or G*” to impose a tax on everything, rendering Free software unsuitable for purpose. It was pointed out to us that Apache played a role in it, too. Sites like Groklaw and Techrights sort of gave up on ASF ages ago, for various different reasons, even well before their chief was a Microsoft employee. 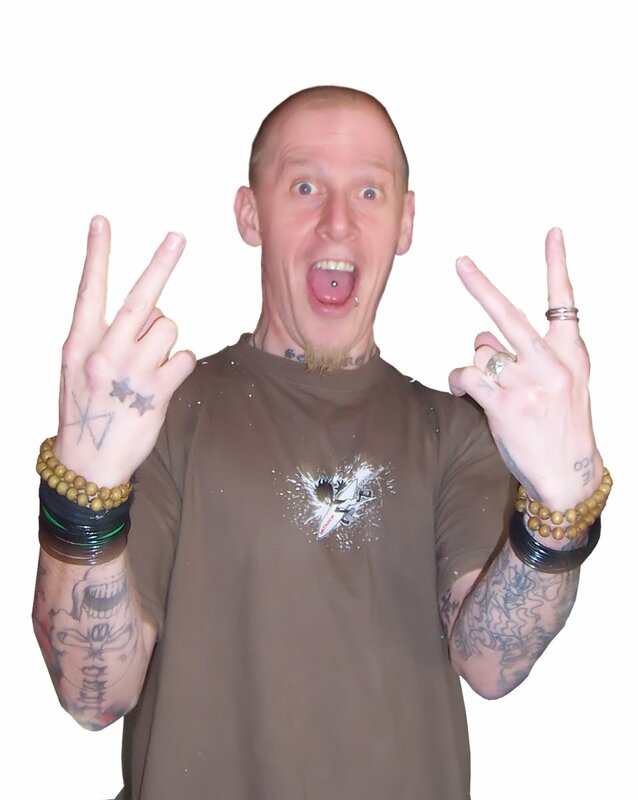 As it turns out, Jim Jagielski became part of the problem and he recently sent a shout-out to Sam Ramji and congratulated Microsoft. It would not be a big deal if he hadn’t also been “very big” on Inner Source, and gave 3 talks at this secret event, InnerSource Commons Fall Summit 2017. “As a reminder, Microsoft is still lobbying quietly (more quietly than IBM) against Alice. 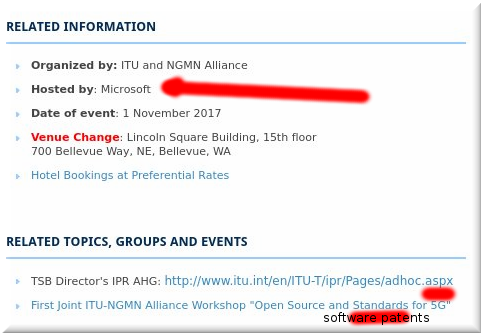 Microsoft wants to leverage software patents against everyone.”Then there’s this event, Second Joint ITU-NGMN Alliance Workshop on Open Source and Standards for 5G. Hosted by Microsoft! This is what entryism looks like. This is the second workshop and the first one was hosted by Qualcomm. * The PR campaign is so strong and so broad that one gets nothing but scorn (like “tinfoil hat”) for being sane and rational about what Microsoft is truly up to. IN PREVIOUS years we wrote a great deal about the ITC. It’s the US-centric agency (not “International” as its name conveniently and misleadingly suggests) that helps embargo rivals from abroad; it does so with patents as a tool/blunt instrument. This is a case and opportunity for the FTC to show it has teeth; it’s also a case by which to squash software patents abuse, as some of the patents at the centre of these shakedowns are Qualcomm’s software patents. EARLIER this year we showed how Microsoft-connected FRAND lobbying yielded discriminatory (against FOSS) policies in Europe. This is not a coincidence, it’s intentional. This is also one way to legitimise software patents through the back door. –IAMFRAND should not be acceptable for standards, for reasons that have been covered to death around the Internet. According to a new press release, NASA makes some patents (not many) “available in the public domain,” to use its own words. 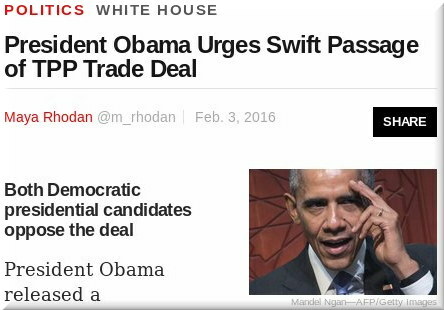 As Red Hat’s Jan Wildeboer put it in Twitter, “Good! But why not all?” We wrote about this before [1, 2]. As NASA is funded by taxpayers, hoarding patents makes no sense, especially when NASA auctions these away to patent trolls who can then tax the public. Heh, no surprise there. Qualcomm is a big Microsoft partner, allegedly “playing nice” for the “internet of things.” Maybe their existence is as a Microsoft proxy and PRISM partner, corrupting free software like Android from the inside. I wonder if they are one of the vendors that aggressively push for non free firmware that the guy behind Core Boot complained about in 2006 or so. “Notice to what degree IEEE policy is guided by multi-billion multinationals.”Notice to what degree IEEE policy is guided by multi-billion multinationals. 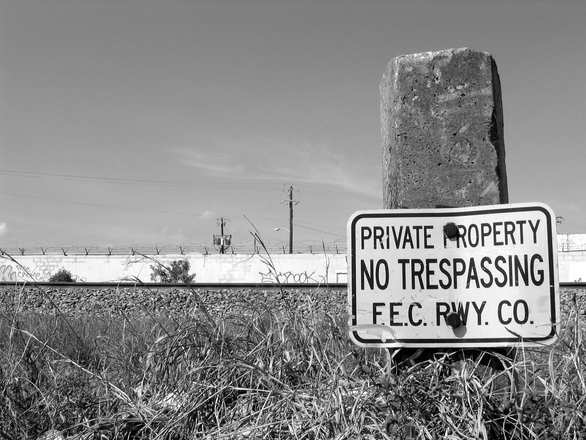 Where are public interests in all this? Well, just like in NASA’s case, we are seeing how even at a Federal or supposedly scientific level there’s no real debate about merit of policies, only self interest of a bunch of billionaires. And that’s a problem.